With Spotify, it is quite easy to access and share a humongous list of tracks or songs by various artists, playlists, albums, genre or record label. We have covered many of these topics in the past, however today we want to discuss an amazing feature that is much less talked about. In fact, not many of the Spotify users know about this wonderful and creative option that they have on Spotify. 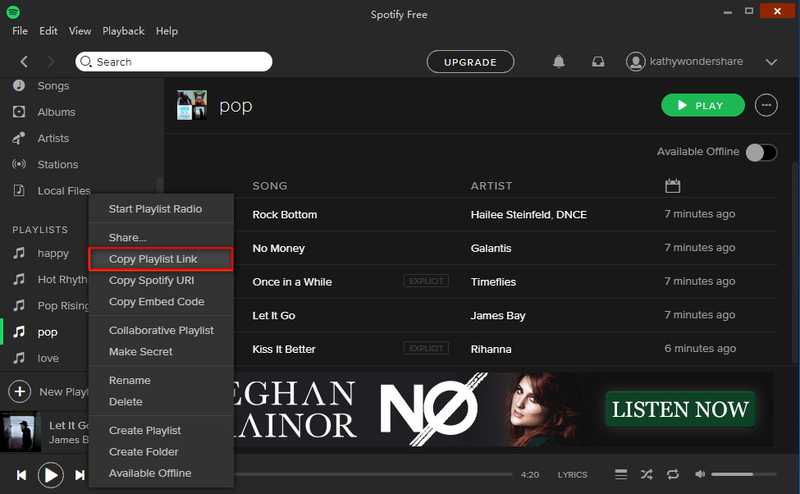 If correctly used, this feature can enhance their user experience on Spotify to a new level altogether. You see, till now Spotify has been too cool letting you create playlists and then share them with your friends. But with this new feature, they have crossed many more miles by giving you the option of being able to work together on a shared playlist, along with your friends and everyone else. That's right, you can now create a playlist on Spotify that you can manage together with your friends and others. Isn’t that just incredible! 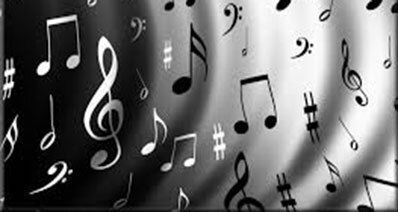 It is called a "Collaborative Playlist" and it is quite easy to create one. We will be letting you know all the steps involved in getting a "Collaborative Playlist" of your own and then have your friends manage it as well along with you. 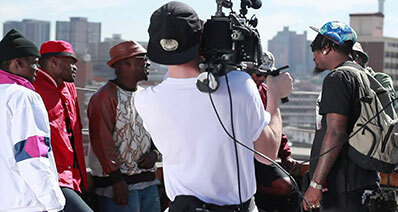 Step 1: Creation of the playlist - You can either create a new playlist from scratch or work with an existing one. 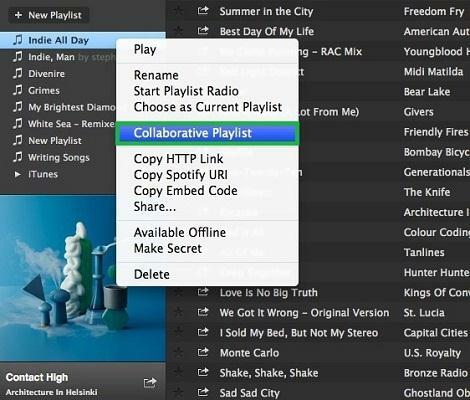 Step 2: Once you have chosen or created the playlist, right click on it and then from the drop down menu, just select the option of "Collaborative Playlist". You will see that as soon as you have done this, the symbol of Music Note right next to the Playlist will turn from White to Green and that a check mark has appeared next to it as well. Step 3: Now, what is left to be done is to share the playlist that you have just turned into a "Collaborative Playlist" with your friends, so that they are able to manage the playlist, add or make changes to the tracks on this playlist too. 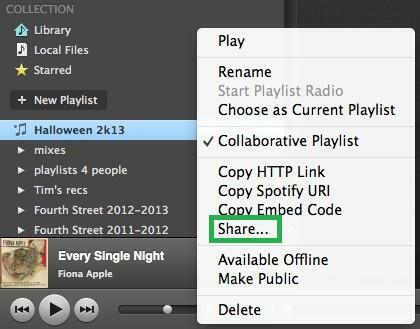 To do this, simply right click on the Collaborative Playlist and from the drop down menu, select the option of "Share". Step 4: Now, as long as you have followed the above given steps correctly and have done everything just the same way as the steps asked you to, your friends should have received a message with a link of the playlist that you shared with them. To be able to manage the playlist, they would not only click on the link but also follow the playlist by clicking on the option "Follow". So, there you go. Using this feature of not only sharing the playlist but also making it collaborative among your friends, listening to shared music has taken a new turn and it certainly becomes more fun. The steps though are slightly different than those given above when using the Spotify app. Here is how you do it. 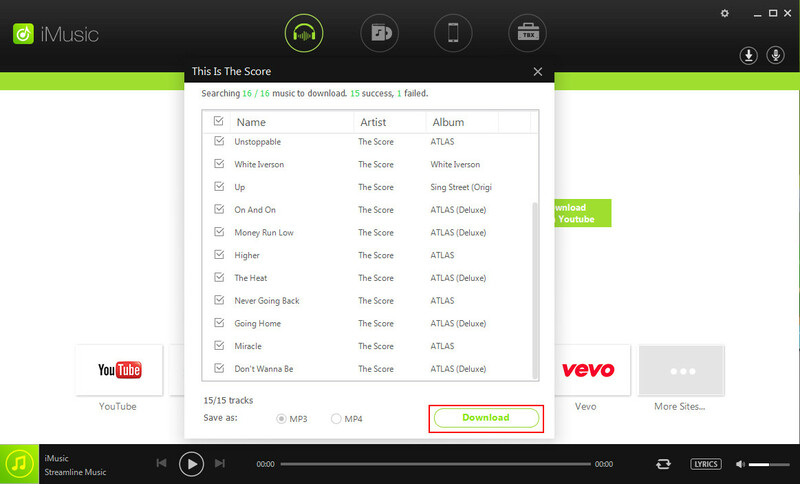 Step 1: Launch the app for Spotify on your Android phone. 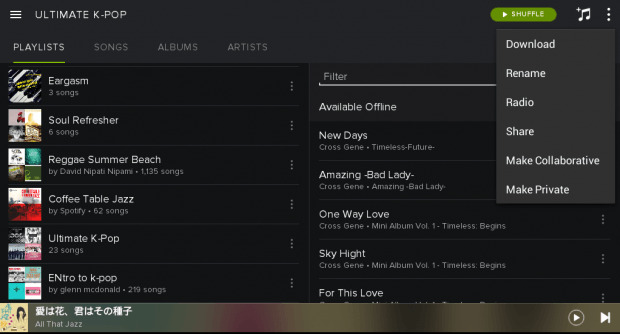 Step 2: From the main menu on Spotify home, select the option of "Your Music" and then click on the "Playlists" option or tab. Step 3: Now, scroll down the list that opens up and select the one playlist you would want others to be able to manage with you. Remember that the playlist you select should not be the one you follow yourself. It means that you can only use a new or an already created and existing playlist and that too only if it was created by you. Step 4: Once you have selected the playlist, tap or press on the menu button given on the top right hand side of the screen. Step 5: From the drop down menu that you get, select the option of "Make Collaborative" and there you go. You have now converted that particular playlist in to a collaborative one that all your friends can edit as well. 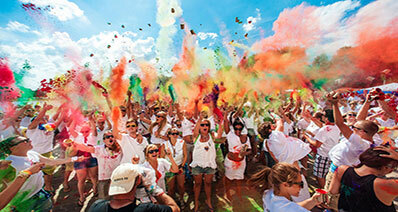 Step 6: One last thing to do is to share this playlist, so that your friends can access it. For this, go to the same menu button that you had just clicked and select the option of "Share". This will send a link to your friends that once they click on, they will be able to edit this playlist along with listening to it and enjoying it.